Headphonaught's Nanolog: Steve McCabe’s "Painting the Evil Man"
I've spoken before about the need for "ginger" to cleanse the palate from the particular flavour of musical "sushi". I listen to a lot of progressive sounds and every-so-often I like to dig deep in another genre, especially folky acoustic sounds. I was given Steve McCabe’s "Painting the Evil Man" a good while back from Resonating Wood but, due to poor health and other reasons, I was unable to post some thoughts until now. 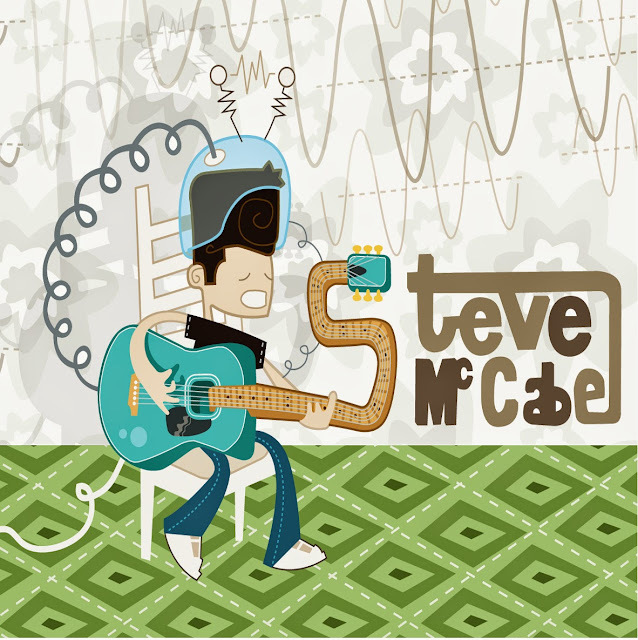 Steve McCabe is an eloquent singer and guitarist, someone equally comfortable singing or playing his acoustic guitar. In fact, he's the kind of overly talented chap who can do both ... at the same time ... very, very well. I have become rather fond of McCabe’s music. I find his playing very reminiscent of Paul Simon's in his Simon & Garfunkel period: eloquent without being overwrought, technical without being flowery, expressive without being verbose; I could listen to his laidback playing for extended periods. It is when he adds his voice, however, that the magic happens. It's not that he’s a brilliant singer, he's very good but has limitations. It's more that he plays to his constraints & makes up for them by being both interesting and engaging. Don't get me wrong, he isn't Dylan or Cohen when it comes to delivery ... he can sing and hold a tune, which is more than can be said for a lot of singers (like Dylan & Cohen). It's just that he has limitations (such as range) ... he has obviously realised this and plays to this constraint. McCabe is both interesting and engaging, singing songs that challenge and provoke thought as well as entertain. Add in his delightful guitar playing and you have something very magical indeed. Many singer / guitarists have a preference ... focussing on one part to the detriment of the other ... McCabe’s music demonstrates wonderful balance - he is equally good with vocals and guitar, and that's rather rare these days. McCabe is the kind of musician I'd love to catch at a small, intimate venue. I could easily see him entertaining a living room full of folk and would gladly host him at my place. Tracks like "Big Brother" with it's delightful melody, expressive vocals and upbeat guitar is one reason for this ... as is "Cave" which has a more melancholic vibe. "The Boatman" is, however, my fave track ... remarkably reminiscent of Simon & Garfunkel's jaunty yet ever so slightly dark storytelling. I would recommend this album to folky folk and others who enjoy expressive guitars & engaging narrative. Have a wee listen below & if you like what you hear, please support McCabe & Resonating Wood. We need more from them.